– David DeJesus got off to a rough start in his first game, striking out three times while going 0-for-4. Normally, DeJesus will platoon with Shane Victorino in left field, but DeJesus was in center for this one because Mike Trout missed his second consecutive game with a sore wrist. David Murphy, one of the other new Angels, went 1-for-4 while playing left field. At least he didn’t strike out. – The Astros re-took sole possession of first place in the AL West with this victory. The Angels, who recently led by two games, have gone 1-5 after a 20-game span in which they went 17-3. 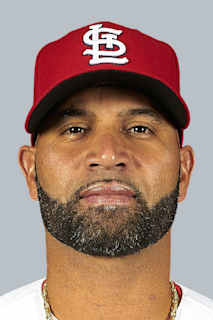 – Albert Pujols hit his 30th home run, becoming the sixth player to hit at least 30 home runs in 13 seasons, the first to do it in his first 15 campaigns. – Not a terrific performance by starting pitcher Garrett Richards. Not horrible, though. He allowed four runs on seven hits in 6 1/3 innings. What’s interesting is that he struck out just three even though he is throwing hard. It’s been a season-long curiosity. Richards struck out 164 in 168 2/3 innings before his season ended with a serious knee injury in August. He averaged 8.8 strikeouts per nine innings. He has just 91 strikeouts in 122 2/3 innings this season, a 6.7 average. The Angels on Tuesday made two trades that brought them outfielders David DeJesus from Tampa Bay and David Murphy from Cleveland. Not long after, general manager Bill Stoneman played host to a conference call. Stoneman talked about the two new outfielders and how they might fit in. Keep in mind DeJesus and Murphy were brought in the day after the Angels traded for outfielder Shane Victorino. During the call, Stoneman also intimated he may not be done. The Angels on Tuesday announced they have acquired outfielder David DeJesus from the Tampa Bay Rays for right-handed minor-league pitcher Eduar Lopez. Also, an industry source confirmed the Angels also acquired outfielder David Murphy from Cleveland for minor-league shortstop Eric Stamets. These moves come a day after the Angels received outfielder Shane Victorino and cash considerations for minor-league second baseman Josh Rutledge. The left-handed-hitting DeJesus, 35, is in his 13th major-league season. He has a career batting average of .276 with 99 home runs and 569 RBIs. He was batting .259 with five home runs and 26 RBIs in 82 games (232 at-bats) this season. Murphy, 33, also bats left-handed. He was hitting .296 with five home runs and 27 RBIs in 84 games (206 at-bats) this season with the Indians. His career batting average is .274 with 99 home runs and 449 RBIs; he’s in his 10th season. Lopez, 20 was 2-2 with an ERA of 4.32 in eight starts in rookie-level ball in Orem. Stamets, 23, was hitting .248 at Double-A Arkansas. The Angels on Monday received outfielder Shane Victorino and cash considerations from the Boston Red Sox for Triple-A infielder Josh Rutledge. Victorino, 34, is in his 12th major-league season and was in his third with the Red Sox. In 2013, his first in Boston, he had 15 home runs and 61 RBIs in 477 at-bats while hitting a career-high .294. He was batting .245 in just 94 at-bats this season, with one home run and four RBIs. 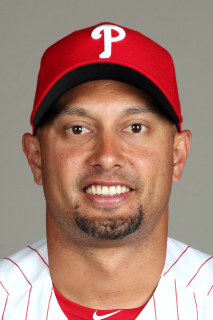 Victorino has 108 career home runs and 486 RBIs with a batting average of .276. He also has been in six postseasons, including the 2008 and 2013 Phillies and Red Sox World Series championship teams, respectively. He’ll get his playing time in left field. Rutledge, a 26-year-old second baseman, was hitting .274 at Salt Lake with five home runs and 32 RBIs in 310 at-bats. He also had 19 doubles and three triples.